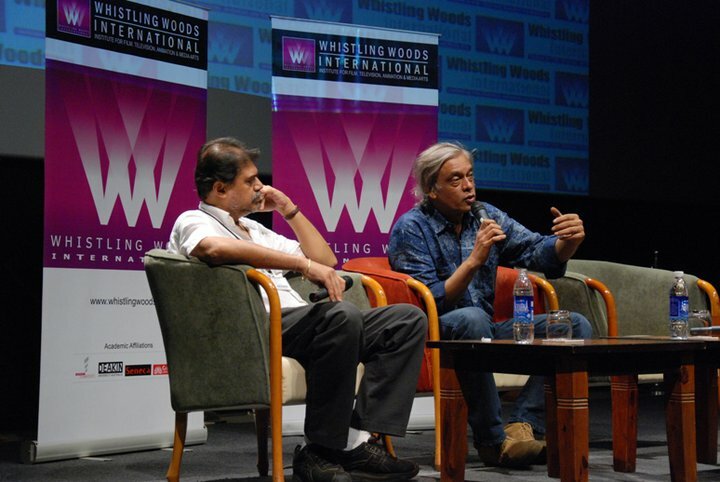 The students at Whistling Woods International were thrilled to have a master class with Sudhir Mishra, renowned director, scriptwriter and well known for his critically acclaimed movies like ‘Hazaaron Khwaishein Aisi’, ‘Khoya Khoya Chand’ and his latest, ‘Yeh Saali Zindagi’. He not only spoke about his experiences, but, also answered the student queries. Sudhir started the master class by quoting one of Steven Spielberg’s famous lines, “If I don’t get nervous every time I walk to my set, I might as well quit film making.” He explained that every time he looked back at films; he saw an unexpected factor to it. When asked about how conscious he is in structuring his movies, he replied that he often rewrites his scripts and there are a lot of changes during the editing of the film as well. He fondly remembers Ms.Renu Saluja as one of his best editors. In the Q&A session with the students, he spoke about his journey as a film maker which began at the tender age of four. From watching a Dara Singh movie, to the movies of the Lucknowi Film Society, he fondly remembers every experience and he credits those movies for his foresight. He advised the students of Whistling Woods International that they must have a workshop with Irrfan Khan, since he is one of the finest actors in Bollywood today. This entry was posted in Academy 2011, Animation, Award, Christian Bale, Controvertial films, Controvertial Movies, Filmmaking, Great Directors, Habib Faisal, Indian Cinema, International Cinema, International Movies, Ketan Mehta, Komal Nahta, Korean Cinema, Maya Academy, Mukta Arts, Oscar 2011, Oscar Winner 2011, PIFF, Pune International Film Festival, Rajat Sharma, Ramesh Sippy, Sholay, Short Courses, Subhash Ghai, Uncategorized, Whistling Woods International, World Cinema, WWI, WWI Student. Bookmark the permalink.